Do you have a dedicated studio space? 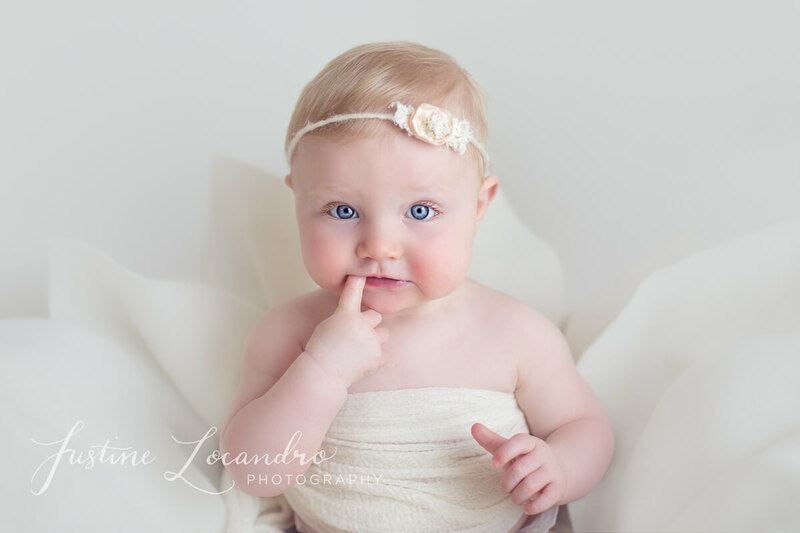 I have a beautiful natural light studio where all of my newborn sessions are held located in Mt Helen, Ballarat. I also shoot maternity and baby sessions here. The studio is surrounded by a beautiful landscaped garden on a bush block, so we are sometimes able to venture outside as well for some outdoor photos for older children, which adds lovely variety to your gallery. What education do you have in photography? I am continually furthering my education and skills in all areas of photography. This includes specific genres such as newborn (and in particular ’newborn safety’), older children and maternity, but also lighting, editing and other aspects of photography. I have completed in person workshops with some of Australia’s most renowned photographers, such as Erin Elizabeth and Kelly Brown – Little Pieces Photography, as well as a number of online workshops with world class professionals. This year again I am flying up to Brisbane to complete another 1:1 mentoring session with Kelly Brown. I use a professional full frame camera and a professional quality, fully calibrated computer monitor. Many photographers use entry-level DSLR cameras which produce low resolution images, and clients are often completely unaware that they are paying for an inferior product. I recommend that you insist your photographer has a FULL FRAME DSLR. This allows you the freedom to enlarge your photos to large sizes whilst maintaining their sharpness and quality. I currently use a professional Canon 5D Mark III, which is a full frame DSLR camera offering superb quality images with extremely high resolutions. I also use a number of top of the range prime lenses. Are your immunisations up to date? Your baby’s health and safety is paramount. All my immunisations are current, including whooping cough and an influenza immunisation annually. Yes, I have Public Liability Insurance! INSURANCE IS ESSENTIAL! Whilst the utmost care is taken to ensure the safety of you and your family, all professional photographers need to have Public Liability Insurance in order to protect clients if something unthinkable were to happen during your session. PLEASE make sure your photographer has insurance. There are cheaper, local photographers, why should I choose you? “The days are long, but years are short’ – I think this is possibly the most accurate description of becoming a parent. Newborn to toddlerhood is fleeting and these precious moments in time disappear all too quickly. My job is to capture these moments and provide you with an entire gallery of timeless, keepsake images, taken with incredible detail and of the highest quality. This way you and your family in years to come can remember and cherish these moments. I am a firm believer in ‘you get what you pay for’ and that quality work is worth the investment. When choosing a photographer do your research. Compare images from different photographers taking notice of how images are styled and how babies are wrapped and posed. Remember to also look at the quality of how images are edited and decide for yourself which you believe to be of the higher standard and how you feel your money would be best invested. If you are wanting to book a newborn session, I recommend contacting me whilst in the second trimester of pregnancy. Newborn sessions are best captured within the first 5-12 days of age to get those ‘curly’, sleepy newborn poses often associated with newborn photography. After this age they become much more alert with stronger startle reflexes. This being said, I can photograph your baby at any age and if your baby is older I can photograph different poses and setups to accomodate your baby’s comfort and needs. Due to the uncertain nature of delivery times, I only take very limited bookings each month to ensure I am able to adequately accomodate each of my clients. Your due date is noted and a session date is confirmed upon your baby’s arrival. For all other bookings I recommend contacting me around 8 weeks in advance. Are images edited on a fully calibrated computer monitor? Most consumer-grade laptops and desktop monitors lack the ability to accurately match the colour and tone of prints; they are often too bright and are unable to display wide colour gamuts. Professional monitors cost upwards of $2500, and are fully calibrated to ensure colour and tonal consistency and to provide the best results possible. Those who do not edit using professional quality monitors which are fully calibrated will likely have images where the colour and tone of your prints will look dull with incorrect colour tones, particularly noticeable in skin tones. I edit using a professional monitor and calibrator, and my monitor is regularly checked and calibrated to ensure colour and tonal consistency,. This way I am able to achieve the best quality artwork for my clients. The colour calibration on my monitor is also consistent with the colour calibration of the printers used at the professional laboratory where your images are printed. Do you offer other professional products? As well providing clients with professionally printed images, I also create custom birth announcement cards and beautiful linen covered, matted photo albums to hold your prints. There is also the option of customised printing on the front cover to include your baby’s birth details. All printing is completed at professional print labs, to ensure the highest quality products to display your art. Do you use a professional print lab? Absolutely. My monitor is also calibrated to ensure colour and tonal consistency with these labs. All my clients receive both the high-resolution digital files of their chosen images, and the corresponding printed images printed by a professional lab. This is done for two reasons, firstly having images printed and ready to frame is time consuming and time is a rare commodity when you are a parent to young children, especially a newborn! Having images printed and in professional quality mats, provides clients with images that ready to frame and display proudly in their home rather than sitting on a USB and on a to-do list. Secondly, it is a quality control measure to show you what your images SHOULD look like when having them printing. The difference in prints from a professional lab and over the counter prints such as Big W is huge, and the quality of prints from a professional lab is always superior. I also offer clients with advice on printing labs that are available to the public and offer professional quality. I would love to hear from you! If you would like further information or would like to book a session with me, please contact me here. Or alternatively via my Facebook page https://www.facebook.com/justinelocandrophotography/. I would love the opportunity to answer any questions you might have or discuss what you would like to achieve for your session.